In it you will enjoy more adventure, more fun, more good stuff. I believe you’ll love it. 280 pages. 17 Destinations. 335 Photos! to make your own travels better and save you money! There are many special features. As a starter: I made a big effort to make the book as complete and practical and true as possible. I wanted it to be not only a good read. I wanted to make it a helpful read. 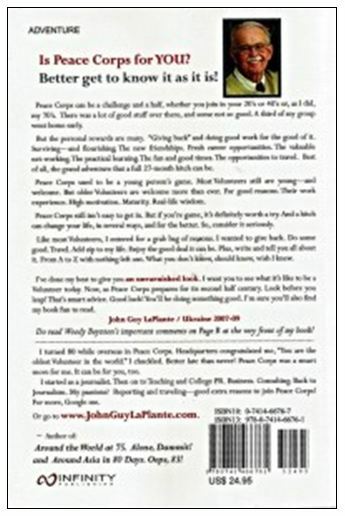 Even an inspiring and life-changing book because you may be thinking of serving in Peace Corps. Or you have a son or a daughter, or even a friend at work, or even a retiree that you may think would get a lot out of being a Volunteer. That’s why I packed my book with extra features. ~ I not only announce each chapter as Chapter 1, or Chapter 2, and so on. A lot of authors get away with just that. My point is: I want you to know what the chapter is about. I don’t want you to waste your time. ~ I squeezed in many photos, of course. Nearly 150! With captions! Photos are essential to tell a story. And captions to understand the photo. 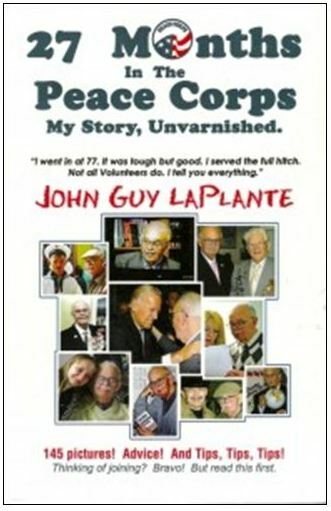 ~ Space allowing, at the end of every chapter I tucked in a “Did you know….” It’s a tidbit about Peace Corps: a significant fact, maybe little known. An insight. A suggestion. A surprise. Something I feel you should know. I closed the book with two chapters that were not easy to write. They were challenging, and in one, somewhat painful. It is entitled “My successes & failures.” It is Chapter 37. It is easy to talk about successes. But important to be restrained. Not boastful. But not easy to talk about failures. But I wanted you to know! Who succeeds at everything in life? Plus, I felt that my failures would tell you a lot about Peace Corps itself. Another is Chapter 40. I called it, “So, what do I think now?” I mean about Peace Corps. Peace Corps is a fine outfit. I’m enormously proud I served. But not perfect. I mention warts and bigger imperfections. But not only that. I make suggestions and recommendations. Again, I felt that you should know. This is why I used the adjective “unvarnished” to tell you about the story you would find in my book. You will find other bold and provocative stuff in it. And as always, I tried to write it in an interesting and significant and compelling way. With strong bones and a lot of flesh on them. A truly good read! When you read it, write a review of it yourself. You’ll be helping potential readers.